Produce the highest quality port wine - a Vintage! 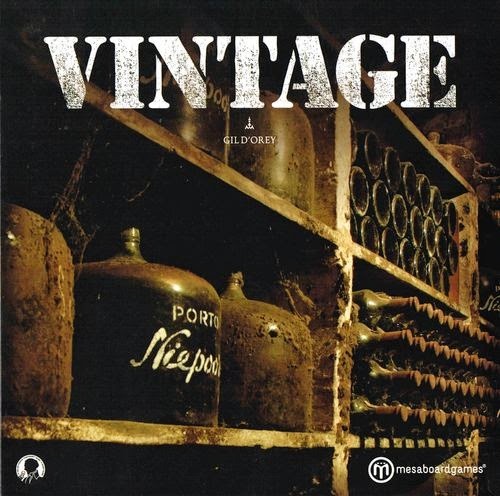 Vintage is a game for anyone who has been interested in making their own wine. Play takes place on a board depicting the Douro River Valley in Portugal where Vintage Port is made. Players compete to buy estates, plant vineyards, harvest grapes, ship, age and sell Ports of varying quality ratings. Players use action markers and an overseer marker to develop and maintain a production flow for 7 rounds. Harvest bonus chips and a dice roll add a level of luck and reality to the variation in product quality during each harvest. Plan well, plant well, and harvest every round if you want to finish with the most Vintage points. In each round, players take turns choosing 1 action at a time and placing their action marker(s) or overseer on an unoccupied circle of that action type in the action table on the game board. The number of action markers it costs a player in order to execute that action is determined by the number of players who have previously chosen this action. For example, if you are the 1st player choosing the Harvest action it will cost only one of your action markers. If you are the 2nd player to choose this action it will cost you 2 of your action markers or your overseer, and so forth. The shipping action is the only action where you cannot use your overseer. You have only 6 action markers and 1 overseer to use per round, so use them wisely. A round ends when all players have placed their action markers and overseer or passed their turn. Additionally, the round starts with 4 face-up cards next to the action table. Selecting the Card action allows players to choose one of the 4 face-up cards, take a blind draw, or play a card previously obtained. Face-up cards taken during the round are not replaced. Each round begins with a new set of 4 face-up cards. The benefits on these can expand the number of actions taken during the round and victory points. 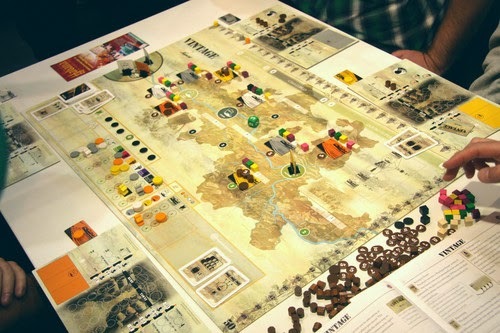 Vintage comes with a double-sided board with the main game on one side and a simpler version for those new to strategy games or looking for something less complex on the flip side.